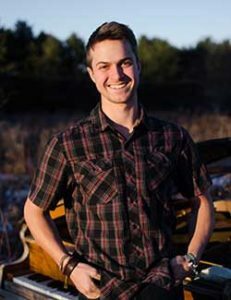 Clayton Clemetson was raised in the New England folk and contra dance traditions as both a dancer and a musician. After years of classical lessons he discovered a love for piano accompaniment at our very own Maine Fiddle Camp at age 11 and the music and community has been central in his life ever since. His style ranges from catchy contra dance grooves to expansive waltzes, influenced by Cape Breton and Irish music with a contemporary twist. After honing his chops under the direction of Doug Protsik, Neil Pearlman, Rachel Aucoin and Julie Vallimont his career has taken wing into the contra and performance scene of New England and beyond. Clayton toured the West Coast and Maine with world class fiddler Mari Black, performed at Ooh La La Dance Festival in Quebec, as the house band for Waltzdays in Harvard Square, and the NEFFA and DEFFA dance weekends. He has produced three albums of original music including The Cat Has No Time for You with Audrey Budington and performed with Kathleen Fownes as The Whom and other talented musicians such as Audrey Knuth and Max Newman.